A musical about writing a musical, can it work? John Barker aims find out. A musical written about writing a musical: uninspired. 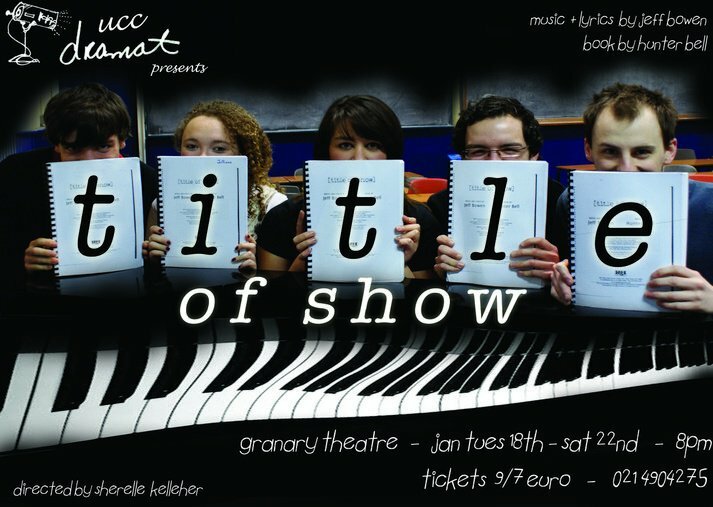 This was all I knew before taking my seat in the Granary Theatre in laid-back anticipation of Dramat’s musical offering “Title of Show”. Based around the shared dream to write a musical, the script follows Hunter and Jeff as they embark on their journey to fulfil this exact dream. Realising they will not be able to do it on their own they enlist the help of friends Heidi and Susan. The audience are subjected to the highs and lows of a somewhat passive storyline, through which they are treated to a very witty script and some Broadway-worthy musical numbers. The script itself left director Sherelle Kelleher with little room for manoeuvre in her subsequent role as costume/props/set designer. Highlighting on a couple of occasions the audience are made aware of the fact that Hunter and Jeff would have nothing more than four chairs and a keyboard (or piano in this case). In this regard there is little comment to be made towards Sherelle’s interpretation of set and props and in spite of my initial thought of how weak it was it all made perfect sense as the story unfolded and the script justified such downfalls. The projection of various scenes onto a large screen behind all the play allowed Kelleher to put her own stamp on the production and it did work quite nicely. In no way did it interfere with or take away from the performance rather it complimented the comedy genre and the simplicity of the production rather well. Costumes were well suited to Kelleher’s interpretation of the characters however I did feel that a little bit more of the Broadway glamour wouldn’t have gone astray and that the costumes still lacked a little in definition of their characters. In her directorial role, Kelleher displayed her strengths in using the space of the Granary Theatre well and in bringing the cast together as a unit. As is essential in the success of any such production, the cast worked well with one another and their apparent happiness with their roles was reflected unto the audience. It must be said however that there was more sexual chemistry between rivals Heidi and Susan than there was with the intended Jeff and Hunter. Gay duo Jeff and Hunter were played by Brett McCoy D’arcy and Mark O’Sullivan respectively. In the choice not to make them the stereotypical flamboyant and over the top gay men, the production may have lost some of its comic potential. In saying this the softer approach to the character of Jeff allowed for a much more believable performance and was sure not to overshadow the other performers on stage as could have been the case. On the other hand, O’Sullivan was indeed a little more over the top in a convincingly hilarious portrayal of Hunter, which brought a much-needed energy kick to some of the scenes. April-Pearl Kennedy stepped into the shoes of Broadway enthusiast and hopeful Heidi, as whom she delivered a brilliant vocal performance, with her solo ‘A Way Back to Then’ being a highlight of the show. Her duet with Julianne Ní Laoire (Susan), Secondary characters, was of exceptional standard and proved to be the peak in the show’s comical offerings. Other musical highlights included Julianne’s rendition of Die Vampire Die which once again had the audience in fits of laughter. All-in-all the show was a success. The talents of pianist Larry (Thomas Doyle) must be acknowledged alongside his patience as he upheld his stillness in the background until called-upon. A round of applause for all.